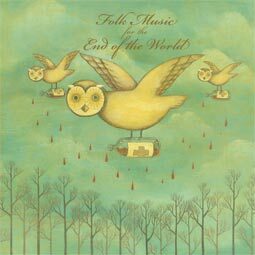 As previously reported, Yer Bird Records just released their excellent, newly compiled folk comp entitled, wait for it, Folk Music for the End of the World! How great — and fitting — is that title? Even better than the comp’s title (not to mention the album artwork by Kathleen Lolly) is the compilations artist lineup; featuring all new and/or unreleased material from the likes of J. Tillman, O’death, Travel By Sea, Matthew Ryan, Paleo and a whole slew of others. Ryan Adams fanatics will no doubt have noticed the change to the artist’s website the past 24 hours. Now when one visits the site they are greeted by a steady stream of falling bananas, a bit of french, and a wordless, continous jam. Anyone know if this “song” has an official name? Until then, here is a rip of it — which I’m calling “Banana Jam”; dig that. The song is called “21st Century War” and was rarely played live before. This album in incredible. Every track stands out and after each listen I find myself drawn to another track that I can call my favorite! Great stuff.